When you approach the Hunsrueck village Hinzert coming from Trier to Hermeskeil on the Autobahn A1 near Reinsfeld, you will see signposts for a special historical place. There are signs showing that there is a place of memorial here. If you follow these signs you will see that you have arrived at a cemetery and a modern house, both of which remind you of a former Nazi concentration camp. If you hadn't made enquiries beforehand, you would hardly notice that more that 10,000 men from over 20 countries had been imprisoned at this historical site between 1939 and 1945. When you first see the idyll of this countryside you would never think that it was here where prisoners were mistreated by the SS, forced to do inhuman work and, in many cases, cruelly murdered. One of the first information papers issued by the Federal State Central Authority for Political Education in the 1980s bore the justified title "The Peace of this Location is Deceptive“. 60 years after the end of the Second World War and after the liberation of Europe from the Nazi tyranny, the documentation and meeting house, under support of the Rhineland-Palatinate State Government, was built next to the memorial of the SS special camp and the concentration camp at Hinzert. 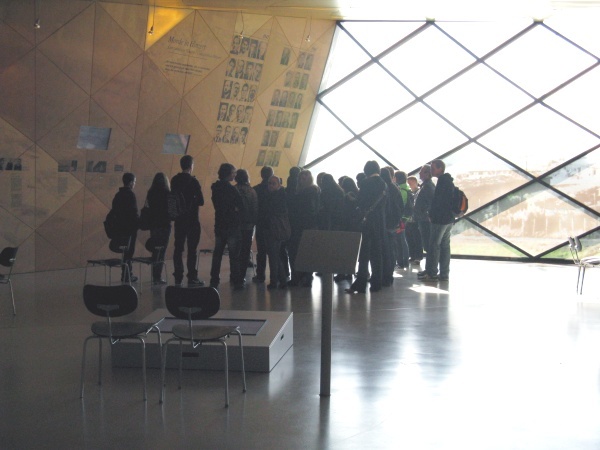 The permanent exhibition on display in the new building provides information on the history of a small concentration camp with documentation, photos, films and, above all, numerous reports from contemporary witnesses. With the aid of the exhibition, it is possible for you to form your own first image of what happened in Hinzert during the war years. The concentration camp received a European dimension due to its function within the Nazi system of concentration camps. This international significance allows this memorial to meet its concerns, primarily by reminding us of the fate of the prisoners from different countries and of the victims who had to die here. It is the second most significant memorial within Rhineland-Palatinate which, besides the Rhineland-Palatinate Nazi documentation centre in the memorial in Osthofen, primarily reminds us of the former concentration camp in Osthofen near Worms (1933-34) and provides us with an overview of the Nazi period in our region.